The definition of upholstery can be said to be, the covering and cushioning of furniture, namely seats, with a variety of different materials. Giving a stool its recognisable style, it includes everything from aesthetic features such as piping and stitched detailing to the type of textile used. The three main materials utilised to cover bar stools are fabric, real and faux leather, each with its signature look. As well as the exterior, it also includes the fibres employed beneath the cover to cushion the seat. If you’re looking for a comfortable seating experience, upholstered stools are the perfect match for you. Each and every one is padded, as it is just as much about the materials used to cushion the seat beneath the external cover as those furnishing the exterior. Whilst bar stools are a relatively recent addition to the furniture world, there has been a vast array of different upholstery techniques used in seating spanning the centuries. Processes have evolved from wooden framed seats swathed in layers of wadding, natural fibres and animal hair of the Medieval period, to the more lavishly padded and opulently designed models of the Victorian age, to the synthetic materials and modern methods used today. Far from being out-dated, some traditional methods are still used today due to the quality of comfort they provide. Ever popular, sprung and belted is a tried and tested method that has stood the test of time, as seen in the Magna. Yet whilst delivering first class comfort, this technique can only employed in four-legged models. The majority of single column designs utilise high-density foam, sculpted into highly ergonomic seat shapes that cosset the body for premium of support. With a wealth of choice available depending on the intensity of comfort you require, you can read our Padded Bar Stools article for more information. By its very nature, upholstery allows for stylish detailing that can set a stool apart from the rest. It’s worth noting that different materials are more suited to certain types of detailing, for example, stitching is more commonly employed in leather products to accent shape. In products like Linear, horizontal stitching skilfully makes the stool more visually interesting and also appear grander and wider than it actually is. Vice versa, vertical panels create a slimline illusion, perfect if you want a marvellously minimalist model. For a more dynamic look, criss-cross or grid panelled designs create a geometric aesthetic, as seen in the Diamond. 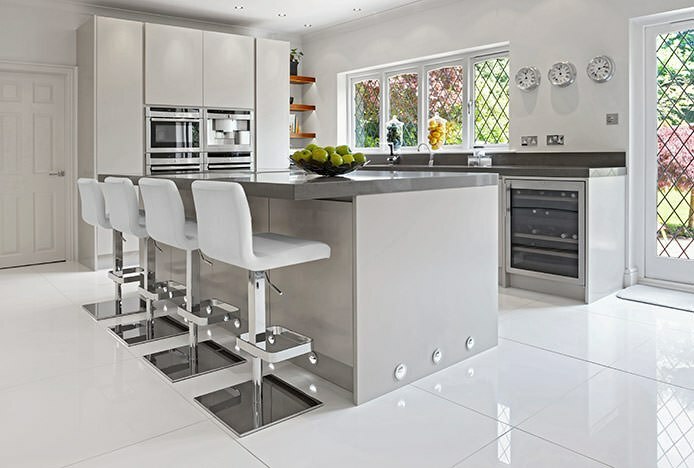 Alternatively, if you have quite a visually busy or cluttered space, choosing a plainer seat may be preferable if you require something sleek but simple. Buttons can add a luxurious touch that will draw in the eye and act as a fashionable point of interest. Marrying retro with modern, the chic panelling and buttons on the Polaris exude a timeless look evocative of the Chesterfield style of chair. Boasting plush upholstered arms for additional support, it delivers a grander armchair-like appeal. Piping is another popular feature used when furnishing bar stools to hide joints and seams in the fabric, subtly adding style and shape to an otherwise plain seat without being too drastic. Swathing the seat, it is the upholstery that makes a stool recognisable and gives it a unique appearance. Bringing a design to life, it is often used to liven up a basic shape and set it apart from the rest. 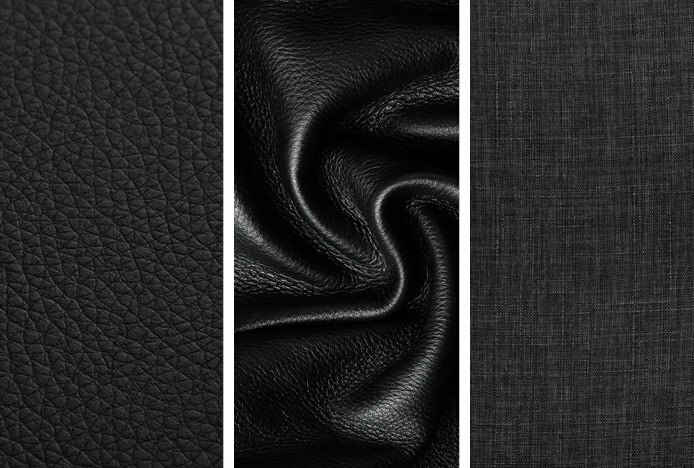 Fabric, real leather and faux leather are the three materials utilised, each with there own advantages. This is a textile, made from woven, right angle fibers which is most commonly used to upholster formal types of seating, and hence offers a grander appearance when used to cover stools. Projecting a timeless aesthetic and homely feel, they provide more of a leisurely dining experience and are available in a vast array of chic colours and plush textures. Whilst characteristically warmer on the skin than some leathers, you should bear in mind that due to its absorbent and sometimes delicate nature, soft fabrics can be more susceptible to staining. Nevertheless, you can have peace of mind with the knowledge that all of our stools are fire retardant to British standard. With the focus on food and drink, bar and kitchen areas are often messy environments. Due to the casual nature of where bar stools are used, often people aren’t as careful and thus there’s an increased likelihood of crumbs and spillages. Whilst the materials utilised for our upholstered products are all chosen with this in mind, arguably some are more hard-wearing than others. Faux is a much sought-after choice due to its low maintenance, wipe clean surface that’s incredibly stain resistant. With excellent elasticity that’s perfect for upholstery, it can be sculpted round any seat shape and won’t crease or pucker with rounder designs. French for fake, its synthetic nature delivers an even, regular finish for a crisp, uniform look that can be dyed to a spectrum of striking colours. For a quality piece of upholstery with a premium luxury feel, choose genuine leather with its chic designer look and signature smell. For a truly exclusive set of stools, each model typically boasts a slightly unique finish due to the individuality of each animal hide. Characteristically durable, it’s rare that it will crack or peel, great for heavy usage in bar and kitchen areas. Instead, any worn spots will acquire a sleek burnished sheen over time that’s unrivalled in elegance. For a prime example take a look at the Zenith, delivering a touch of class wherever it’s placed. Or for a more expansive piece about the benefits and differences between real, faux and bonded, why not read our helpful Advantages Of Leather article. Whatever your preference, simply click the button below to browse our vast collection of bar stools and treat yourself today. 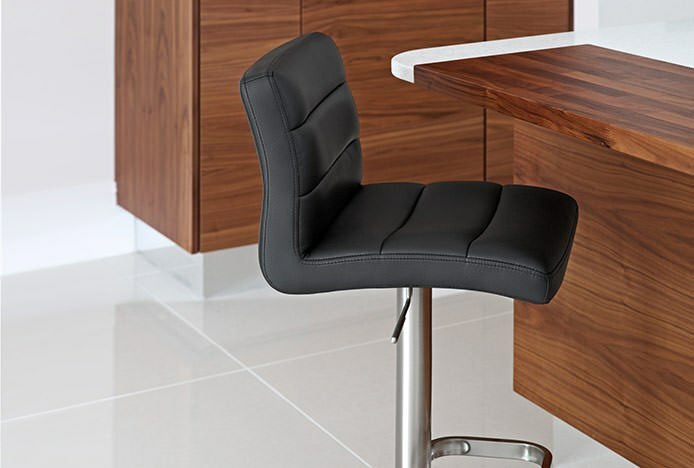 We take a look at the benefits of faux, real and bonded leather bar stools.. Stylish, comfortable and durable, leather is the ideal choice for chairs..
Sumptuously luxurious designs to add a touch of elegance to your home..